You get two pictures today! 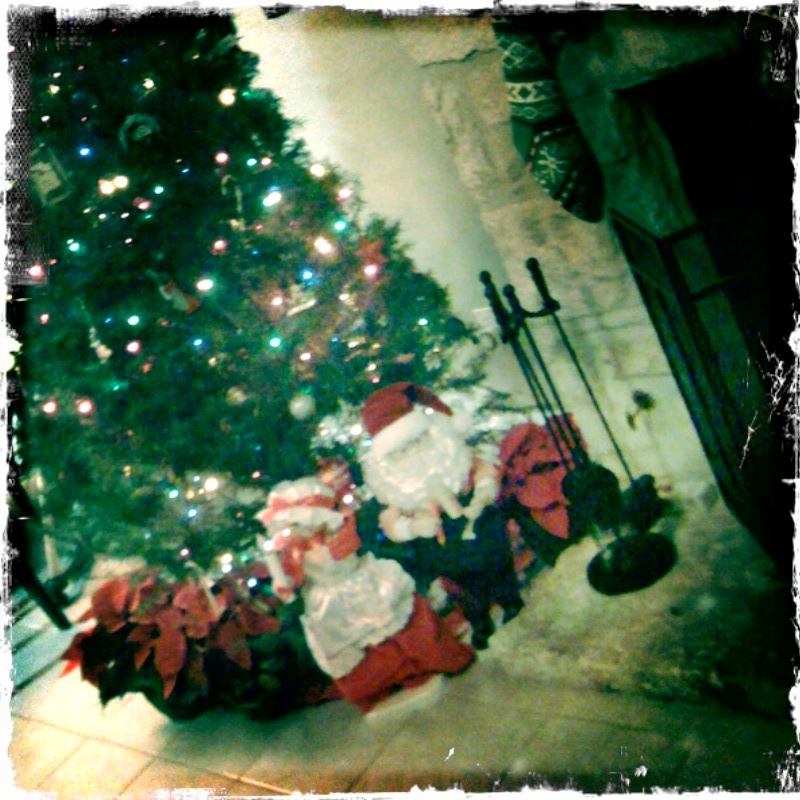 The feature is our Christmas tree. The past two years we have chosen to go with a real tree. I think next year we will move to fake. I will miss the smell but I will not miss stringing lights. One tradition we keep in our house is the eclectic tree 'theme.' We all get a new ornament each year that represents us in a unique way. For example, I got a car ornament when I was 16 and I had a runner ornament in 2000. Mark and I chose to hold on to that concept/tradition rather than buy matchy theme ornaments. It's fun to reminisce when you are hanging up the old ornaments. This year Chloe got her 'Baby's First Christmas' ornament. I bought Mark a lacrosse player ornament and we all got our initials for the tree, including a 'G' for the family ornament. 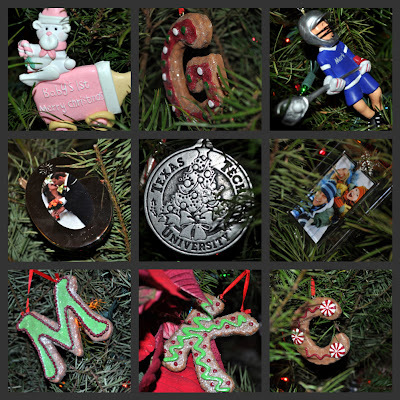 The Texas Tech ornament in the middle is old, but it's where Mark and I met so I featured it. The picture ornaments are a new tradition that Mark and I started when we married. Every year we buy a frame ornament and put a picture from that year in it. In 20 years, we'll have a tree full of pictures! I'm sure you've noticed that this year's frame still has the 'hallmark' family in it. I'll change it soon. Love the ornaments! We have the "cookie" initials too for the kids! Will you share what you're using to edit the pictures like that? I still haven't figured out the video editing thing you do! I seem to be a little slow these days! Can't wait to see tomorrows picture!! Kim,Glad you have Santa and Mrs Clause. Those were under our tree for many years. Did you read the list that Santa has? Your tree is very pretty and I always had things that had special meanings. (Did Diane have the Santa dolls too?) I like the ornaments you have chosen. I agree about the smell of a real tree but I too hate putting lights on the tree but taking them off even more. I like your ornaments.